Love is in the air! There are places in Gdańsk where it feels like love is in the air. It can sometimes be felt only on some days in a year while in others, the magical atmosphere remains throughout the year. Engagement on the seashore by the setting sun or perhaps a romantic date in the centre of the city? Every dream can come true in Gdańsk and the city itself is a perfect background for the most beautiful love stories. Is there a more romantic way to spend time together than an evening walk on the beach by the setting sun or in the moonlight reflected on the surface of the sea? Gdańsk beaches attract large numbers of tourists, especially in the summer when the water is quite warm. Lover couples can be met there in great numbers. Most popular beaches are located in Jelitkowo, Brzeźno (with the only pier in Gdańsk) and on the Stogi. However, if you want to take a break from the hustle and bustle and go for a long romantic walk visit the Sobieszewska Island where the beach is wild, wide and… can surprise you with amber! Who knows, perhaps your find will be perfect for an engagement ring? 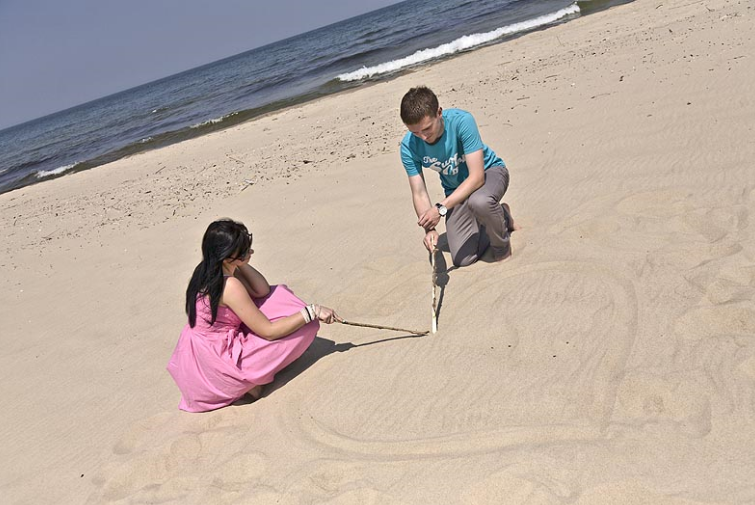 Looking for treasures on the beach together can be great fun. You can also talk wrapped in a blanket, looking at the horizon lit by the setting sun. The beach itself is a perfect place to awaken emotions but the access to it can be equally interesting because you will encounter the Ptasi Raj (Birds' Paradise) nature reserve on your way. We are sure it will not disappoint you.